Adapted from the stage play, Heaven Can Wait, Alexander Hall’s 1941 Here Comes Mr. Jordan is notable mainly for its numerous remakes and its position as arguably the first supernatural comedy. 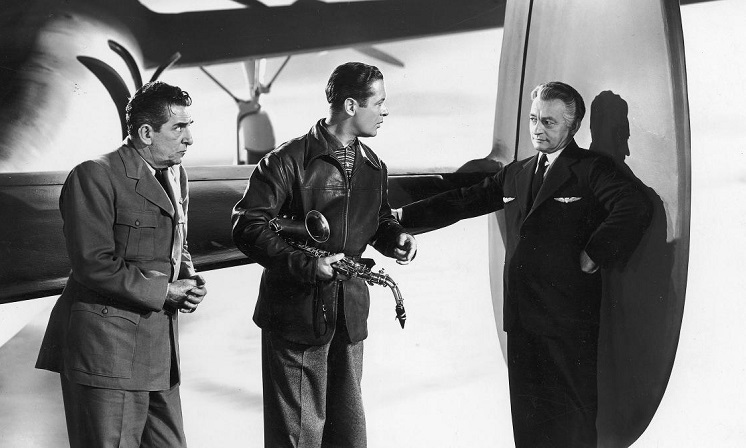 Following his untimely demise, boxer Joe Pendleton (Robert Montgomery) is taken to heaven only to meet the eponymous angel Mr. Jordan (Claude Rains), who agrees to find Joe a recently-deceased body in which to live out his life. Things are complicated, however, when Joe occupies the murdered body of Bruce Farnsworth, a roundly despised corporate tycoon whose possession by Pendleton diverts his tarnished legacy on to a better path. If this sounds familiar, it’s probably because it is: Mr. Jordan was remade twice, first starring Warren Beatty in 1978, and later as Down to Earth, a risible 2001 comedy starring Chris Rock and co-written by Louis CK. Here Comes Mr. Jordan‘s premise also has more than a little in common with evergreen classics A Matter of Life and Death and It’s a Wonderful Life, but lacks the depth and humanity of both of those later masterpieces. Interestingly, the playful banter between Pendleton and Jordan is also strongly reminiscent of beloved 80s time-travel series Quantum Leap. There’s even an ‘oh boy’-esque mirror gag early on in Mr. Jordan, and Pendleton’s philanthropic efforts clearly prefigure Sam (Scott Bakula) and Al’s (Dean Stockwell) mission to ‘set right what once went wrong’. Rains, as ever, brings laconic charm and wit to his Mr. Jordan, but Montgomery struggles as the straight man of the piece in a dull, flat role, whereas Evelyn Keyes does her best in a minimally- written part as Pendleton’s love interest. The production itself never quite manages to escape its stagey trappings, with much of the action taking place in Farnsworth’s mansion. Aside from a few nice dolly shots and some handsome, impressionistic sequences in heaven, much of the cinematography is dully functional, a far cry from the gorgeous, contrasting imagery of A Matter of Life and Death. Here Comes Mr. Jordan, as nicely conceived as it is, is by no means a classic: even within its own subgenre there are far better examples of supernatural comedies. On its own merits, Rains typically elevates the production, and there are some nice comic moments peppered throughout, but more interesting than the film itself is its influence on film and TV. Here Comes Mr. Jordan is essentially a proof-of-concept for It’s a Wonderful Life and A Matter of Life and Death, superior films of course, but indebted to their progenitor. Moreover, its later influence on Quantum Leap (which itself strongly informed Duncan Jones’ terrific Source Code) is clear, and at a stretch could even be said to have paved the way for the popular cultural juggernaut of Ghostbusters. If for no other reason than its place in comedy history, Here Comes Mr. Jordan is interesting, if dispensable viewing.